If you’re looking for ways to improve eyesight naturally, here are 5 simple things you can do to improve your vision. They helped me reduce my prescription by 30% for my left eye and about 15% for my right eye. And I got rid of the astigmatism in my right eye too. My father has a -6.00 prescription for nearsightedness and my biggest fear as a kid who started wearing glasses at the age of 11 was to have eyesight as bad as my father’s. Of course, what you fear is what you attract. By the time I was in my twenties, my prescription was stronger than my dad’s. And then I found a book on natural vision improvement and it blew me away. I didn’t think it was possible to improve your eyesight, short of Lasik surgery. I started doing a handful of the eye exercises in the book and my prescription reduced by two quarter diopters (0.5). And then a funny thing happened. I stopped doing the things that were helping me improve my eyesight. I hit a plateau because I only focused on the physical exercises. After the initial improvement, I didn’t do anything again for close to 10 years. And then, in January of 2012, after an intensive year of self-growth and discovery, I decided that I was ready to see and be seen again. Once I started focusing on clearing the energy and emotions related to seeing clearly, things really started coming into focus. My left eye is now -4.25 (formerly -6.25) and my right is -5.75 (formerly -6.75) with no astigmatism. At my current rate of vision improvement, I expect to be under -4.00 within 6 months. The last time I was there was over 20 years ago. And if I can reduce my prescription by over 40% in a year, then it’s totally possible to be free from glasses for the rest of my life. And that is why I’m so passionate about sharing this with you. Seeing without glasses is life changing. Not just for getting rid of your glasses, but for opening your eyes to what is possible and what you are capable of achieving. It’s a journey to see without glasses and I hope this article will help you take your first step, and the next one and the next one. This is the cornerstone of the Bates method of natural vision improvement. It’s very simple to do and if you get creative, you can find ways to palm without having to set aside time to do it. Why not give it a try now? If you’re sitting at a desk, rub your palms together until they feel warm, take off your glasses (after you finish reading this paragraph), and then place your palms over your eyes as you rest your elbows on the table. The key is to relax your shoulders, neck and eye muscles while the heat from your palms soothes your eyeballs and the surrounding muscles. Breathe in deeply and imagine that you are looking off into the distance watching the ocean waves or anything else that is relaxing and pleasing to you. The more you can palm, the better. Aim for 5 to 10 minute stretches to start. Here’s my creative tip for finding time to palm. I palm while sitting on the toilet ;). You jest! But it adds up to several minutes a day without any extra effort or time commitment on my part. The beauty of palming is that if you activate the energy centers in your palms, you can use your qi (life force energy) to heal your eyes. I’m creating a class right now on improving eyesight naturally, and one of the things I want to do is to guide students through a qi gong exercise to raise the energy coming through their palms. Qi from your hands is incredible healing energy. I’ve used it to recover from bruised ribs in half the time the doctor said it would take me to heal. Why not use it for your eyes too? 2. Go take a walk. If you want to improve your vision quickly, take a 20-minute daily walk outside if you can, preferably in nature, but cities work too. Here’s the catch. Do this without your glasses on! If you’ve got a strong prescription, I totally get that this is going to feel a little scary. So go somewhere really safe where you can’t get hit by a car and try walking without your glasses for a few minutes at a time. Keep adding time until you’re comfortable and feel confident. You’ll notice that you really need to look and pay attention when you don’t have your glasses on. In some ways, you’ll see better because you won’t go into that zone where you can tune stuff out (here’s a hint why people plateau). If you were to imagine the walls of a room when you’re outside, you’d really notice just how short a distance that is. It feels claustrophobic. When you’re indoors all the time, your eyes are confined and they don’t get room to stretch out. 3. Take off your glasses and set your eyes free. Glasses help your eyes see perfectly as long as you look through the center of the lenses. Notice how things distort just a touch when you look at the perimeter of your lenses. What happens then, is that your eyes get used to always staring through the center of the lens and they don’t move around as much. Basically, your eye muscles have to hold your eyes in a fixed position in order to see. Unfortunately, it’s the lack of movement that keeps tension in your eyes. When you take off your glasses, your eye muscles get the opportunity to relax. Your eyes can move around more and that is highly beneficial for improving your vision naturally. Consider this analogy for a moment. How do your legs feel when you’re stuck on an airplane in a cramped seat and you can barely move them? The circulation gets cut off and your legs feel antsy and then they start to get cramped up. Imagine if you were stuck like that for decades. You’d lose a lot of flexibility and motion in your legs. Same goes for your eyes! Set them free by going without glasses whenever it’s convenient and safe to do so. You can start by removing them when you’re at home. E.g. when you’re brushing your teeth, eating, doing laundry, etc. When you feel ready, start taking off your glasses in different situations where it feels a little scary to get by without them (e.g. washing dishes, at a meeting at work, socializing with friends, etc.). Improving your eyesight isn’t just about what you do physically, but also about stretching your comfort zone a little. I’ll write way more about this in a subsequent post because I believe this is the most important way to improve your vision if you have a strong prescription or if you hit a plateau. 4. Use eye exercises to improve eyesight naturally, but always in moderation. There are two eye exercises that I practice for about 30 to 60 seconds each day. Here’s one of them. It’s an exercise that works on the principal of memory and imagination. Memory and imagination help you fill in the blanks faster when you’re looking at something. For example, it’s always easier to pick out your loved ones from a crowd because you’re using your memory of what they look like to help you find them. Thus, exercising your memory and imagination can help you to see. To practice this eye exercise to improve your vision, take off your glasses and hold a book in front of you at whatever distance is comfortable for you to read, even if it’s only 2 inches away. Cover or close your left eye and then focus on one letter of the page with your right eye. Trace the outline of the letter with your eye. Then, close your right eye and picture that letter in your mind’s eye. Try to imagine it as clearly as possible. Open your right eye and look at the same letter again for a few seconds. Envision it being blacker than all of the other letters. When you start noticing this, it means that you are improving your vision. Repeat this 2 to 3 times. Then do the same exercise with your left eye. When you are finished, gently massage your eyes or cover them with your palms. Here’s where eye doctors will warn that eye exercises to improve your vision can be harmful. You’re working your eyes to focus, relax and then focus again. Any exercises done in excess will cause eye strain, which is harmful for your eyes. You can’t muscle-build your eyes to improve your vision naturally. The key is to relax your eye muscles so that your eyes can lose their rigid lack of focus and relax into clarity. 5. Loosen up with shoulder rolls and head turns. Tension in the eyes is always accompanied by tension in other areas of your body such as your face, jaw, neck and shoulders. Shoulder rolls and turning your head from side to side are really beneficial because they help improve circulation and release tension. From a Chinese Medicine perspective, they also help improve the flow of energy in your body. For the head turns, stand in a relaxed position and then turn your head slowly to the left and then slowly to the right. Do this for about 12 repetitions. If you want to get a two-for-one deal, when you reach the end of your head turn, pause and then look as far around as you can with your eyes. This way, you’ll get to exercise your eyes too. Be sure to keep your shoulders relaxed as you turn your head. Here are three books that have helped me improve my vision and reduce my eyeglass prescription. I’ve included a short review about each book below. This is where it all began for me. A friend lent me this book and I devoured it in one sitting, which by the way, I don’t recommend unless you take reading breaks to allow your eyes to relax. The great thing about this book is that it’s short and sweet. It gives you a simple explanation of the anatomy and physiology of the eyes and then explains the theory behind why wearing glasses can result in an increase your prescription. There are also a few short chapters on different things you can do to improve your eyesight naturally. The only shortcomings for this book are that it was first published in 1929, so the writing is a bit dry and fuddy duddy. Also, I believe the book is out of print, so it may be a bit harder to get a copy. I consider this title one of my favourite books on how to improve vision naturally. The reason I like it so much is because it’s one of the few books that actually gets into the mind/body connections related to seeing without glasses. I feel that most of the books and videos out there are all about eye exercises you can do to improve your eyesight. That’s fine and dandy if your eye prescription is mild. However, if you have a strong prescription, there’s a lot more going on than just having tension in your eyes. Nobody gets to a -6.00 or higher prescription for nearsightedness without there being some underlying emotional and mental triggers. I’ll be going into much more detail about this in a follow-up article in this series on how to improve your eyesight naturally. To me, the emotional and energetic aspects are THE most important component for reducing your glasses prescription and improving your vision. 3. Relearning to See: Improve Your Eyesight Naturally! This book is like a university textbook on vision improvement. If you’re a left brain analytical type, I’d recommend this book for you. It goes into a lot of detail about the physiology and anatomy of eyes. When I first got the book from Amazon, the sheer density of the book totally turned me off. However, as I deep-dived into ways to improve eyesight naturally, I found that understanding how our eyes function really helped me visualize, so to speak, the healing process. Lost within the multitude of pages is a chapter describing exercises you can do to improve your eyesight. I felt this book didn’t have as many eye exercises to improve vision as the other two books. However, for a really in depth understanding of your eyes and how you see, this book was excellent. I also found it funny that the author’s name is Thomas R. Quackenbush. Some fodder for people who think natural vision improvement is a bunch of quackery! This article is super long already and as I’m writing it, I’m realizing that I could be here writing for days on how to improve eyesight naturally. In the interest of posting this article, I’ll give you a little preview of the reflexology point for the eyes here and promise to share more in the near future. 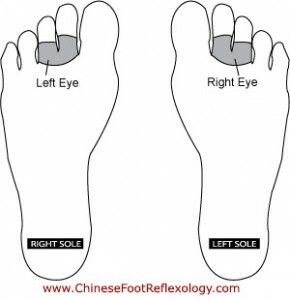 Here’s a diagram of where the Chinese Reflexology point for the eye is located. You can SEE that there are points on the soles of both feet. In my next article, I’ll share how to massage these points to help you improve your eyesight, as well as how I used them to reverse and completely heal early stage macular degeneration in my own eyes. What’s Next on How to Improve Vision Naturally? I hope this article on how to improve your eyesight naturally will help you to see more clearly and experience dramatic shifts in vision improvement. Implementing these 5 habits are an excellent way to begin your journey to seeing without glasses. And, when you’re ready to take it to the next level and see with greater clarity, I’ll be here with more words of wisdom to guide you.